At Raven, we are committed to service — both to our external customers and fellow team members. 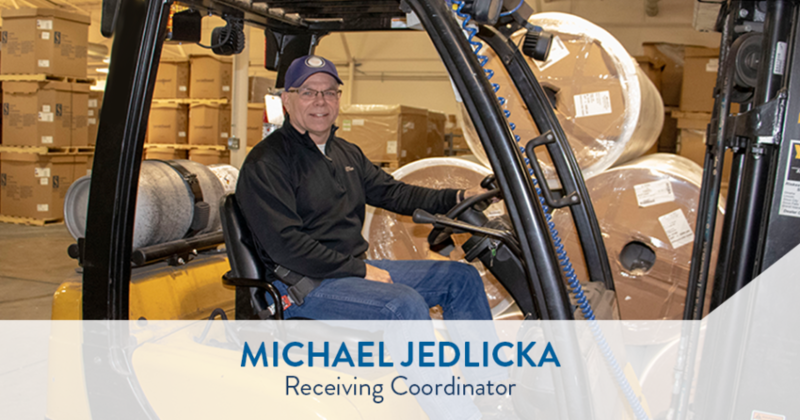 Michael Jedlicka, Receiving Coordinator for Raven Engineered Films, demonstrated an outstanding commitment to service to his team, working many long days to successfully coordinate and receive an extra 2.89 million pounds of fiber for the Engineered Films team. Congratulations, Mike, for being named this month's Team Member Spotlight winner! Mike provides outstanding service in Raven Engineered Films' receiving department in Sioux Falls, receiving everything that comes his way. This includes everything from normal offloading of incoming goods to fielding emergency scenarios on a daily basis. Recently, due to the imposed tariffs on imported goods, Engineered Films purchased enough fiber to fulfill the next few months of forecasted orders. This meant that the expedited orders had to be received and offloaded quickly, as the location was receiving four extra truckloads of fiber per day, or 74 extra truckloads in total. Mike played a key role in the coordination and teamwork that went into the offloading of the extra 2.89 million pounds of fiber. He worked many long days to unload the excess trucks and to ensure that all paperwork was taken care of. Thank you, Mike, for your dedication to service and quality, ensuring that the fiber was received and stored properly!